Received February 2nd, 2011; revised May 4th, 2011; accepted June 2nd, 2011.
the interpretation of victories and defeats. scales of attitudes and behaviours of athletes or coaches. 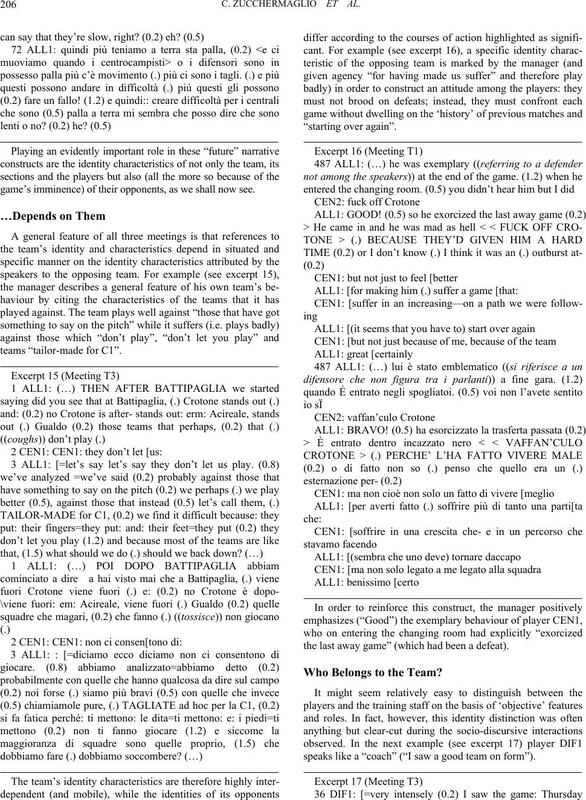 interactions of an Italian soccer team. social activity, not something they ‘are’” (Widdicombe, 1998: p.
the activities of specific groups and communities. 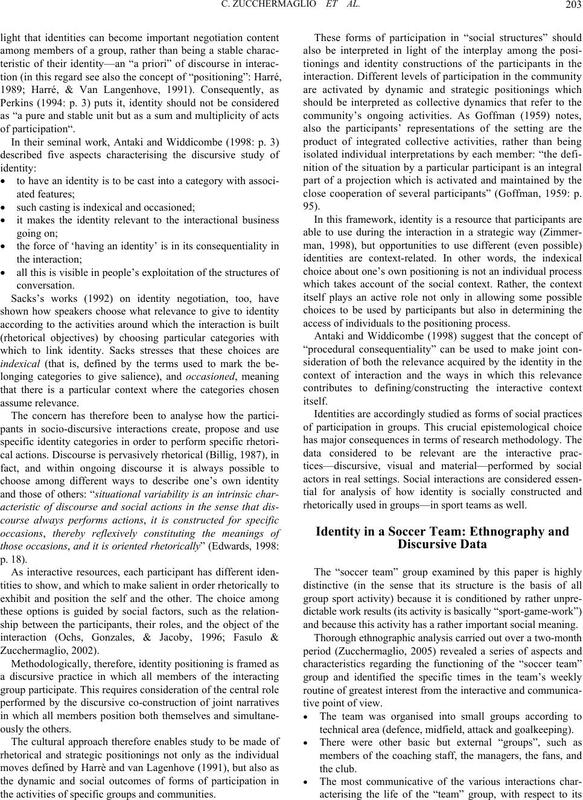 close cooperation of several participants” (Goffman, 1959: p.
access of individuals to the positioning process. rhetorically used in groups—in sport teams as well. and because this activity has a rather important social meaning. technical area (defence, midfield, attack and goalkeeping). the weekly game (usually on a Tuesday). held in the changing rooms or in an area of the coaching field. pletely transcribed using Jefferson’s method (Jefferson, 1989). around which the interactive discourse revolved. which specific blame could be attributed in the event of defeat. and identity positioning) performed during them. “pedagogically” by the manager and the coach. the pitch (on this see Fasulo, Zuccchermaglio, 2008). man in midfield rather than an extra man in defence”). Federation security measures forbade it. 3There were 26 participants; 20 were speakers. victories), is that the players are “C1 people5”. obvious we’d always win, but we’re C1 people playing in C1! di C1 che gioca in C1! (0.8) allora? settimana specialmente a Orazio qualche volta (0.2) o a Misiti. haviour is more closely shared. game’s imminence) of their opponents, as we shall now see. the last away game” (which had been a defeat). Who Belongs to the Team? speaks like a “coach” (“I saw a good team on form”). 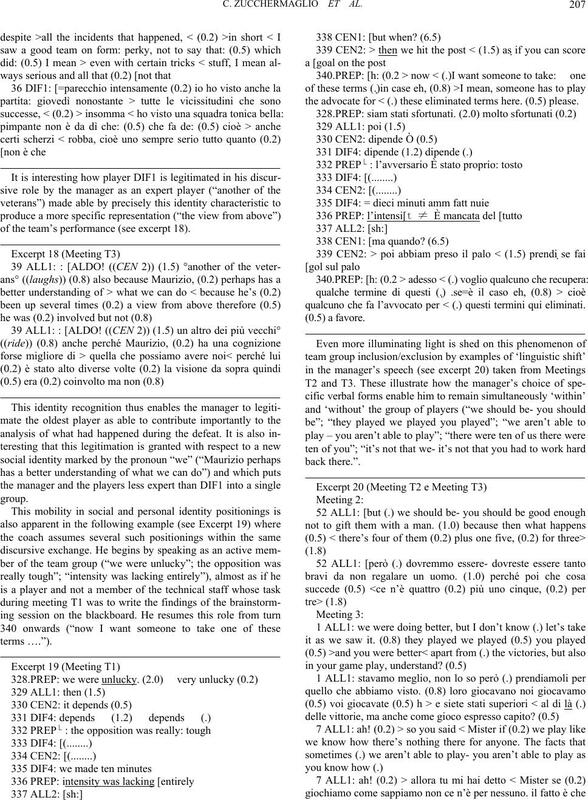 of the team’s performance (see excerpt 18). the advocate for < (.) these eliminated terms here. (0.5) please. qualcuno che fa l’avvocato per < (.) questi termini qui eliminati. that we had- it’s not that you had to work hard back there. goals and to perform specific actions. determine its strengths and weaknesses. members and in the socio-physical setting in which they act. construction of a group’s situated social-discursive practices. 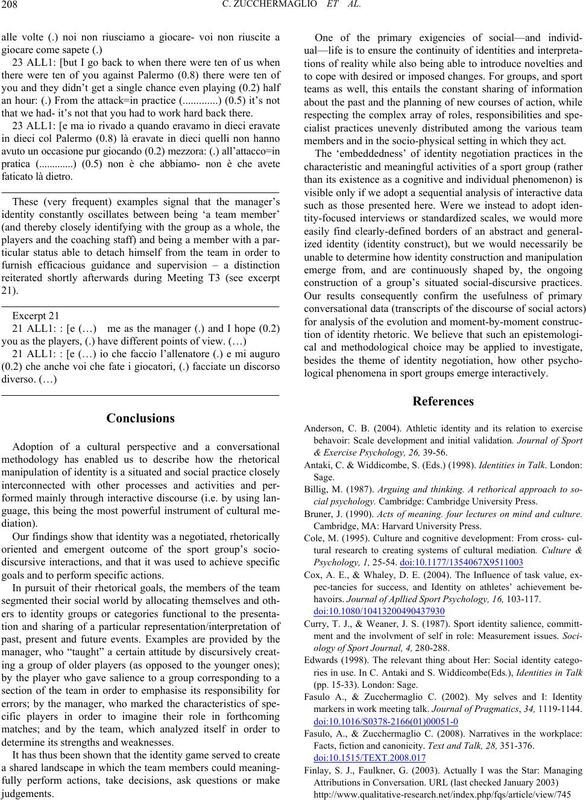 logical phenomena in sport groups emerge interactively. & Exercise Psychology, 26, 39-56.
cial psychology. Cambridge: Cambridge University Press. Bruner, J. (1990). Acts of meaning. four lectures on mind and culture. havoirs. 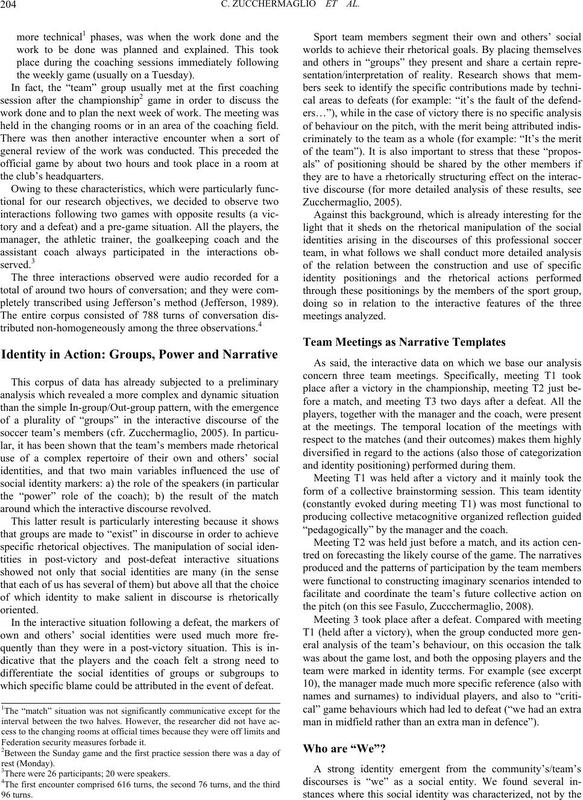 Journal of Apllied Sport Psychology, 16, 103-117.
ology of Sport Journal, 4, 280-288.
markers in work meeting talk. 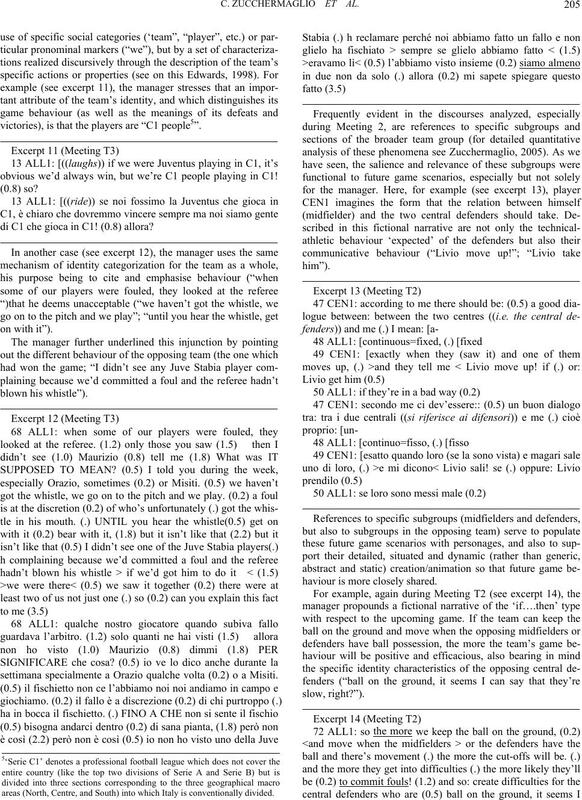 Journal of Pragmat ic s , 34, 1119-1144. Facts, fiction and canonicity. Text and Talk, 28, 351-376. Harré, R., & Van Langenhove, L. (1991). Varieties of positioning. 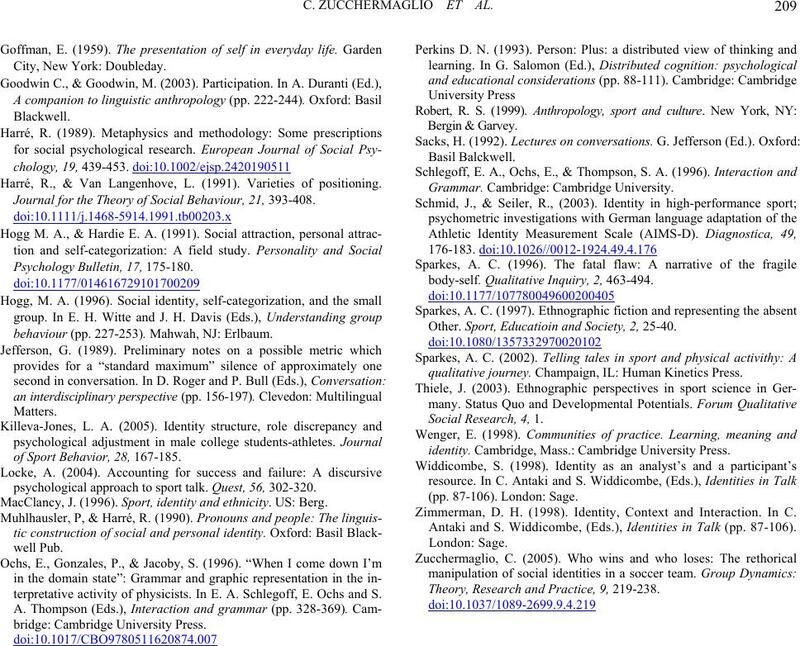 Journal for the Theory of Soc i a l Behaviour, 21, 393-408.
behaviour (pp. 227-253). Mahwah, NJ: Erlbaum. 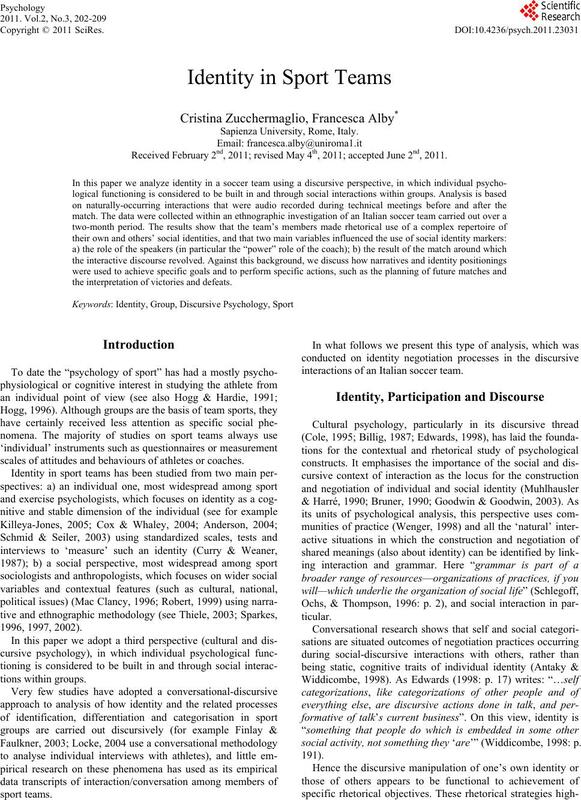 of Sport Behavior, 28, 167-185.
psychological approach to sport talk. Quest, 56, 302-320. MacClancy, J. (1996). Sport, identity and ethnicity. US: Berg. terpretative activity of physicists. In E. A. Schlegoff, E. Ochs and S.
body-self. Qualitative Inquiry, 2, 463-494. Other. Sport, Educatioin and Society, 2, 25-40.
qualitative journey. Champaign, IL: Human Kinetics Press. identity. Cambridge, Mass. : Cambridge University Press. Zimmerman, D. H. (1998). Identity, Context and Interaction. In C.
Antaki and S. Widdicombe, (Eds. ), Identities in Talk (pp. 87-106). Theory, Research and Practice, 9, 219-238.